The Lagrangian points are locations in space in the vicinity of two orbiting masses where the gravitational forces and the orbital motion balance each other to form a point at which a third body of negligible mass would be stationary relative to the two bodies. There are a number of web resources describing the Lagrangian points, some of them offering a very good introduction and description of the 5 Lagrangian points, while others insist on the techical aspects of the problem. Nonetheless, in the following article we'll try to add to the non-mathematical and intuitive descriptions available on the web (like, for instance, the ESA page related to the 5 lagrangian points or the Wikipedia article) a detailed-mathematical view of the problem, starting from the technical defintion which states that the Lagrangian points are the stationary solutions of the circular restricted three-body problem. Now let’s introduce in the system the Coriolis force and the centrifugal force. The first term from the formula above determines the position of the equilibrium points, and the second one determines the stability of motion about the equilibrium points. From the condition we will find the position of the equilibrium points. 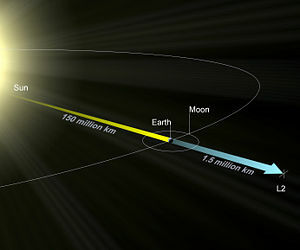 In particular, if we consider we can find the first 3 Lagrange points (located in the line Sun-Earth). Let’s replace in the above formula the fact, that . We have now to solve these 3 equations. We can do this either by using an approximation considering the particularity of the system Earth-Sun or we can solve it numerically using the Newton method. Let’s first consider the approximation and try to find a series which approximate the real solution. expressed in km from the center of mass of the system. In the particular case of the L2 point which will focus on we found it at 1507717.38502939 km from Earth on the line which lies the Sun and the Earth. Let’s find now the solutions for the other 2 Lagrange points. So the two solutions are . expressed in kilometers from the center of mass of the system. where is the solution of the equation which gives us the L2 point. If we obtain a Halo orbit around L2. As can be seen, the exponential part of the equations results in a very fast grow of the orbit and, as consequence, the satellite will escape from the desired orbit. In conclusion the satellite should be kept in a liniarised Lissajous orbit such that the exponent is null.